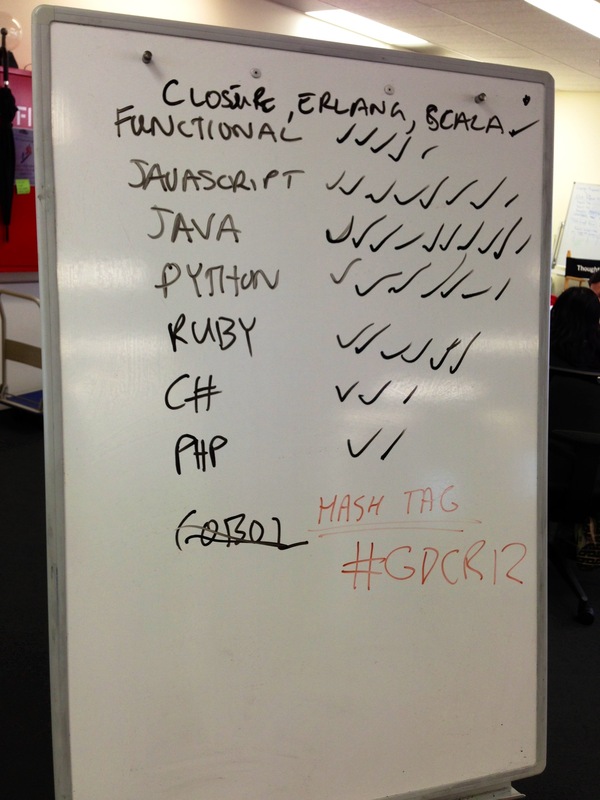 I was at the Global Day of Code Retreat (GDCR) event in Melbourne on 8 Dec 2012. A code retreat is a great way for software developers to practice their coding skills. Since I was merely an observer on this event, I could have a good view from the outside in. Lot’s of energy there everywhere! Here’s what I saw. 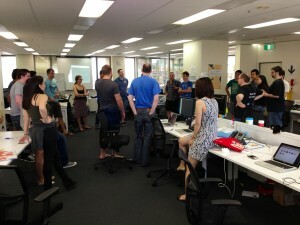 Get a bunch of coders gather in one place for a full day. Let them work in iterations of 45 min on an exercise. Delete the code immediately after each iteration. After each iteration do a quick retrospective. You’ll always work on the same exercise, which is to implement Conway’s Game of Life. It’s on purpose that you’ll never be able to finish the implementation – it’s all about learning new skills and mastering existing ones. You’ll work in pairs during the iteration. This not only increases your coding skills, but also your social skills. You can use any programming language you want in your pair, as long as there’s at least one in your pair who’s familiar with the language. That’s because you don’t want to waste your iteration on figuring out how to set up your environment to please the foreign language. Better to concentrate on coding! On the other hand, it’s a great way to have a deeper look into a new language with a native speaker next to you. Since code retreats are rooted in the Agile Sofware Development movement, it’s very likely that you’ll you test-drive your code. And if you’re not familiar with Test-Driven Development (TDD), it’s very likely that you’ll find a pair who is. The GDCR is an event taking place once a year. In 2012, there are more than 150 GDCR events in cities all around the world with about 3200 developers attending. In Melbourne the code retreat is held at the ThoughtWorks offices with about 20 coders. 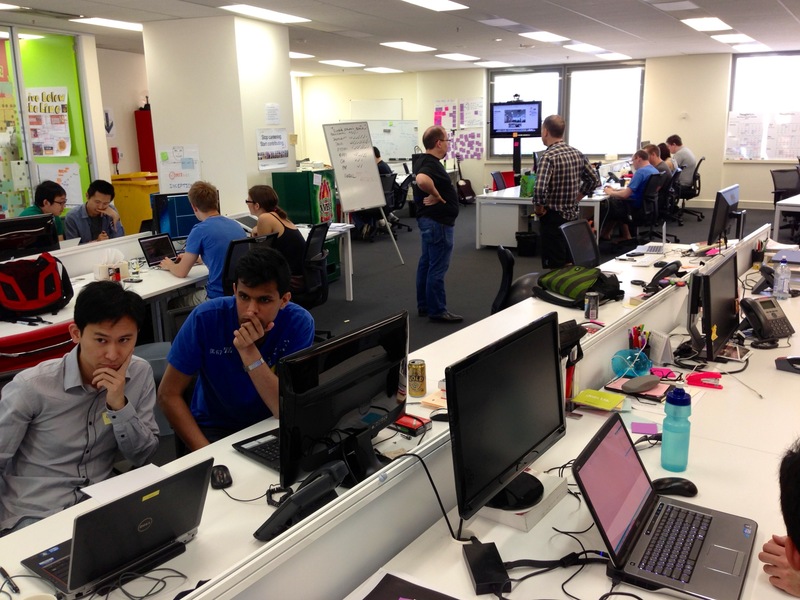 Kornelis “Korny” Sietsma and Marc Galbraith are doing a great job in organising and facilitating GDCR in Melbourne. The most awkward thing happening at code retreats is almost always the deletion of code after an iteration. Korny and Marc announced the last five minutes, and after the full 45 min iteration ran out, they turned on a machine voice from one of their computers which stated repeatedly: “Delete your code! Delete your code! Delete your code! …” Almost immediately some coders responded with “Noooo! I’m not finished yet …!” Marc explained the point of the deletion: “It’s not about the code in your notebooks. It’s about the experience in your heads!” And that’s exactly the point. Korny and Marc insisted on deleting all the code. 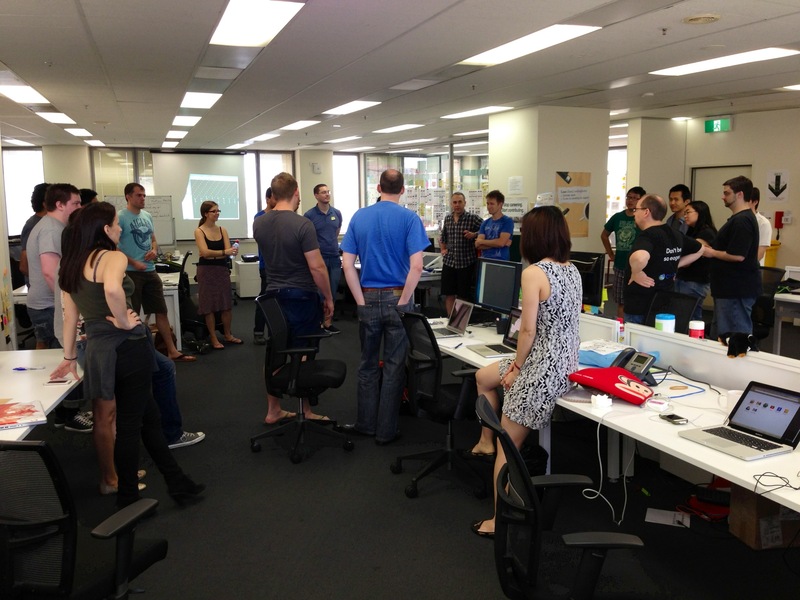 Every coder was encouraged to stand up after they deleted their code. Afterwards, Korny and Marc ran a quick retrospective where the coders shared a few learnings with the group and reflected on what they did. Corey Haines, one of the inventors of code retreats, gives an introduction in this video on vimeo. There are more code retreat happening around the world, not only on this special date of the Global Day of Code Retreat. Find out if there is a upcoming code retreat event in your area. Everyone can host a code retreat. If you want some good advice, I recommend Alex Bolboaca’s blog post “How to Organize A Code Retreat“. Everything (and more!) about code retreats you’ll find on the official site: coderetreat.org. This entry was posted in General and tagged agile developer skills, it-agile-blog-planet. Bookmark the permalink.